Data reuse seems like a topic that’s been covered for a long time. The idea of re-using a digital mockup across the product lifecycle has been around for over 20 years. And yet, today, effectively reusing CAD data across different applications throughout product development remains a challenge for many companies. One key problem is simply failure when translating a 3D model from one format to another, or when moving data from one application to another. Accurate translation just isn’t a given in many of today’s workflows. Problems also arise when users have to manually duplicate similar information in different applications. The list of scenarios where this can occur is actually quite lengthy: product manufacturing information (PMI) from CAD drawings often needs to be re-created in metrology applications, constraints created in CAD applications need to be redone in analysis applications, and so on. A final challenge around data reuse is the inability to propagate file changes outside of engineering. If a change is made to the original CAD file, data copied into downstream applications becomes outdated. Often there is no smart mechanism to update this data, which results in needing to manually update each new file revision — a costly and error prone process. People have used workarounds for these issues in the past. But with the growing rise and embrace of concepts like Industry 4.0, Model Based Definition (MBD), digital continuity- inefficient workarounds are no longer an option. 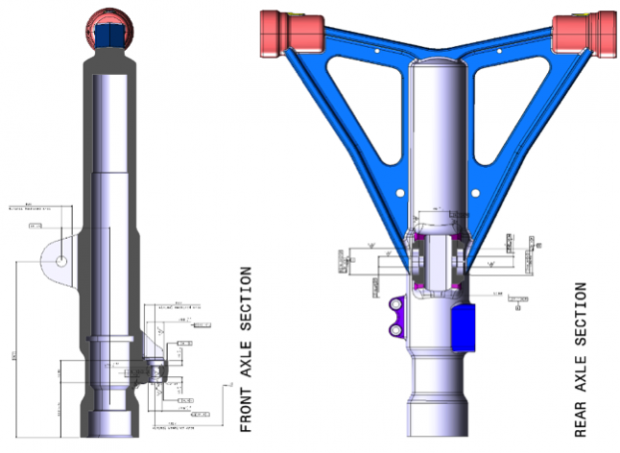 All of these concepts rely on the ability to effectively reuse CAD data. Fig. 1: The Model Based Design (MBD) paradigm is about reusing CAD data as the master model, about having one source of information, used across the product lifecycle, across multiple applications. For some examples that illustrate this point, let’s take the sample of in-process control. The idea here is to use CAD data, sensors, and algorithms to systematically detect deviation in real time and optimize machine settings automatically resulting in a much-optimized process that saves time and money. To achieve these results, different pieces of software (manufacturing analysis inspection) have to work together to exchange data back and forth in real time. If you start duplicating data between these applications, the whole concept is broken. The 3D printing industry provides another example where data reuse is critical. In a traditional manufacturing scenario, it was okay for an engineer to spend two or three hours duplicating information in another application because that information was then used to produce dozens or hundreds or thousands of parts. Much of the value of 3D printing, however, is its ability to produce small series of parts — if not unique parts. As a result, the cost per part becomes prohibitive if you have someone manually recreate data for a single part or a small run. Clearly, the ability to reuse CAD data across the product lifecycle is essential in an Industry 4.0 context — and this requirement has not gone unnoticed by large engineering and manufacturing software vendors. To take steps towards better digital continuity, they have aimed to control the full product lifecycle chain, from design to manufacturing to control. Fig. 2: The need for full control of data and data reuse is something big companies like Siemens, Autodesk and Dassault understand. 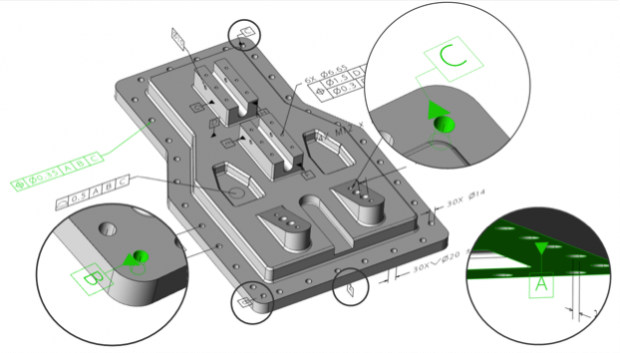 The vendors first started moving in this direction by merging CAD & CAM, and later by integrating analysis modules into both design and manufacturing software. More recently, we’ve seen inspections tools added into CAD systems, and this integration has resulted in more efficient processes. This approach doesn’t work for all software development companies, however. For starters, independent software vendors can’t always plug their solutions into CAD applications. Beyond this is the simple fact that we live in a multi-CAD environment. As much as it would simplify things from a data reuse perspective, there will never be one universal CAD standard. The bigger a company is, for example, the more chance there is that they use data from several different CAD systems. Fig. 3: HOOPS Exchange can retrieve all PMI from major CAD systems — Both Semantic & Graphical. We’ve invested greatly to ensure that we handle PMI extremely well, as we know how critical it is for reuse in other applications. Support One Master Model. It is critical to have one master model used across the product lifecycle. This avoids duplication by allowing access to a rich model that contains not just the Geometry, but all product information, including manufacturing and control information. Leverage the BREP. BREP (geometry and topology) is the starting point for CAD data reuse. The quality of the BREP is critical for many workflow It’s is used to generate mesh, tool path computation, to slice the model before 3d printing it, and more. Reference Data Instead of Copying It. When moving data across the product lifecycle, the Master Model paradigm gets broken if data is just copied and pasted between applications. There now exist must preserve the digital continuity of their data by referencing it rather than copying it. Support New CAD Standards. Standards are the way many in the industry exchange CAD data and there is quite a bit of activity to enable standards to assist with digital continuity and automation like Step AP242, JT 10.0, and PRC — allowing customers to reuse their data no matter the scenario. At Tech Soft 3D, we have squarely taken aim at these areas with HOOPS Exchange, our software development toolkit for data access and reuse. Most manufacturers live in a world that is still pretty far away from having a seamless data workflow. This means that there is a massive opportunity for software developers to provide capabilities that solve real problems and deliver real value to their customers. With the right tools, they will be able to take a giant step closer to this goal and ensure effective data reuse across the product development process. Originally published at www.digitaleng.news on August 15, 2017.